The new Samsung Galaxy Tab S3 is announced and will be available in Q2. The new Tab S3 now comes with the S Pen for even more versatility. Yes, it is like the Apple Pen. The Galaxy Tab S3 features an Improved S Pen that feels and works like a real pen. Featuring an elastomer 0.7mm pen tip with industry-leading sensitivity that recognises 4,096 levels of pressure and a slide-proof 9mm comfortable and stable grip, the enhanced S Pen grants users a more natural handwriting experience. It resembles a full sized pen which would allow you to quickly jot notes on the go with Tab S3. 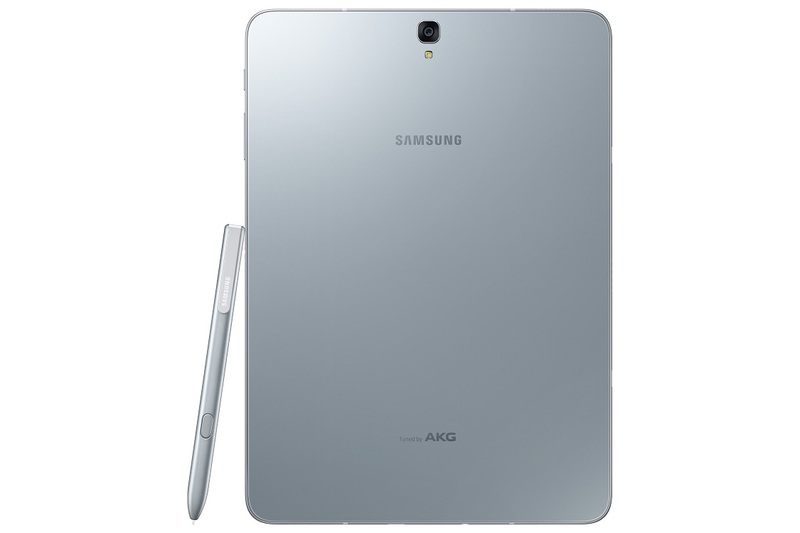 By incorporating some of the best ideas from the Samsung Galaxy Note series, I think it provides for a useful added dimension to the stagnating Android tablet market. Users can quickly and easily bring their ideas to life whenever inspiration strikes, by simply using Screen Off Memo and pinning the memo to Samsung Notes, all without unlocking the screen. Consumers also have the option to pin their memos to the Home Screen and view it whenever they want. Keeping notes, sketches and drawings organised is now easier than ever with Samsung Notes. With the addition of specialized brushes for Chinese calligraphy, watercolour, and oil drawings – users can mix different colours and quickly switch between brushes and pens to express their artistic talents. With the Smart Select function, users can use the S Pen to easily create and share GIF animations while the Air Command functions, such as Magnify and Translate, allow users to hover their S Pen over an image or word to zoom in or even translate languages. Air Command also allows users to annotate PDF files with the S Pen so they can add notes directly to the document with ease. For added convenience, users can access their favourite apps in an instant just by tapping on a shortcut via the S Pen while the new Glance function allows users to minimise one app in the corner should they need to refer to information from another app. If you watch a lot of shows on your tablet, and I am sure there are many, you would be pleased to know that the new Tab S3 comes equipped with Quad Speakers tuned by AKG by HARMAN for a premium listening experience, allowing users to enjoy multi-channel audio on-the-go. With its auto rotate stereo capabilities, consumers will be able to hear rich sound from the corresponding speakers based on the device’s orientation. For the first time in Samsung’s tablet history, the Galaxy Tab S3 sports a Metal and Glass finish – a signature of Samsung Galaxy smartphones. The look and feel of the reinforced glass is complemented by scratch-resistant, anodised AL5000 series aluminium for enhanced durability. Out of the box, it runs on Android Nougat. It runs on a Samsung Exynos chip (seems to be the same as the Galaxy S7) with 4GB ram. Storage is 32GB but allows for expansion with a microSD. The display is on 9.7-inch QXGA Super AMOLED display the Galaxy Tab S3 offers users an immersive viewing experience. The Galaxy Tab S3 also features a 10bit HDR video playback so consumers can enjoy a wide range of stunning HDR videos with richer colours and greater contrast. For times when a pen is not good enough, there’s a new Samsung keyboard accessory that uses POGO pins. It’s similar to the iPad Pro keyboards too. The Galaxy Tab S3 will be available in Q2 2017 in Black and Silver with both Wi-Fi® and LTE versions at major Consumer IT & Electronics stores, Telecommunication Operators, Samsung Experience Stores, and Lazada Singapore. Traditional Wallets often carry more than what you really need, and minimal ones can’t seem to carry enough. First world problems indeed. What if you could carry exactly what you need, when you wanted to? That was the motivation behind MAG: a modular wallet with a magnetic hinge that allows you to swiftly detach and reattach! Magnet-based Kickstarter projects from Singapore is a new trend. Quotidian Pen – Fiddle. Spin. Flick. The pen built for fiddlers. Quotidian is a world’s first magnetic propulsion pen. I think springs or caps work fine, but I do agree, it’s something quite magical to watch the pen nib propel out when you bring the cap to the body. Each Quotidian contains super strong axially magnetised rare-earth magnets, which sound way cooler than Neodymium magnets, which allows it to function. They are indeed very strong and quite fun to mess around with. That’s until you lose the cap though – good luck with using your pen after that. Just gotten news from the PR Agency representing HTC in Singapore, The HTC 10 will be available in Singapore from 1st August 2016, for SGD 898/-. Pokemon Go is still not launched in Singapore but there is a new way to play it on your Windows PC with KOPLAYER. This China company is marketing its Android emulator as a way to play Pokemon Go. Afraid of going out into the streets in this not-so-safe world we live in? Considering the possibility of bad traffic, poor road conditions and car accidents? Sick of battery issues? They are now introducing a new way to play Pokemon GO on your PC computer in a safe way with a bigger screen and more fun via KOPLAYER Android emulator. Hilarious really. But KOPLAYER is riding on the Pokemon Go craze to it’s Android emulator. Pokemon Go has really shaken the world. Even our Singapore minister says it will monitor the game’s impact on society, while our neighbours Malaysia are worried about the game’s impact. Based on augmented reality, just about everyone has heard about this game. Hundreds of those adorable, yet ferocious, little creatures have invaded our real world, well except Singapore, Malaysia, and a whole lot of other countries really, so you would need to spoof your location in order to play the game. You may get banned though, so you may want to check out how not to get ban while spoofing your GPS location on Pokemon Go. With KOPLAYER, it is all setup to play Pokemon Go. The APK is a click to download, and the location is pre-set to Sydney Australia. Pokemon GO gamers can use their keyboard to control and move in a convenient way. Click keyboard setting to use the WASD keys then you can walk anywhere on the map without going outside to waste your battery and date usage. It’s really easy to use. I would only advise you not to use your actual Google account, you never know what information is transferred through the app. The app should be released in Singapore really soon though. Going by Niantic CEO, John Hanke’s words, it is almost certain that the rest of the Asian countries including Singapore, India, Malaysia, China and others would be getting the official game release in the next few days. Samsung Pay is officially launched in Singapore. They have partnered with the major banks in Singapore, POSB/DBS, Standard Chartered, OCBC, and Citibank, and there’s a whole lot of advertisement budget to encourage usage. Read on to find out how to maximise your rewards and get up to 25% cashback and free Samsung accessories, you may even win a phone!